Received: September 7, 2018; Revised: October 25, 2018; Accepted: November 1, 2018.; Published online: February 5, 2019. Robotically assisted mitral valve repair has proven its efficacy during the last decade. The most suitable approach for patients with difficult anatomies, such as morbid obesity, sternal deformities, cardiac rotation, or vascular anomalies, represents a current challenge in cardiac surgery. Herein, we present the case of a 71-year-old patient affected by severe degenerative mitral valve regurgitation with pectus excavatum and a right aortic arch with an anomalous course of the left subclavian artery who was successfully treated using a Da Vinci–assisted approach. Robotically assisted mitral valve repair has been introduced as a way to perform top-quality mitral valve operations through a less invasive approach [1,2]. Although several authors have reported highly satisfactory results, some issues regarding the safety and efficacy of this technique are still a matter of debate, especially in patients with challenging anatomy. Herein, we present a representative case of a patient in which a robotic approach was used in order to deal with multiple anatomical obstacles. A 71-year-old female patient was scheduled to undergo mitral valve surgery due to severe symptomatic mitral valve regurgitation (New York Heart Association class III) with isolated annular dilation and paroxysmal atrial fibrillation. The patient presented with class I obesity (body mass index, 31 kg/m2) and a clinical examination showed an excavatum-like sternum (Fig. 1A). Chest computed tomography showed complete levorotation of the cardiac chambers with partial sternal compression on the right ventricle. The distance from the skin to the left atrium and the Sondergaard sulcus was 11 cm (Fig. 1B). Moreover, a right aortic arch (Fig. 1C) with anomalous origin of the left subclavian artery with a retro-esophageal course (Fig. 1D) was detected. Since sternotomy should be avoided when feasible, mitral valve repair using a Da Vinci System (Intuitive Surgical Inc., Mountain View, CA, USA) was scheduled. After positioning the patient with a 30° orientation of the right chest, surgery was performed using the Da Vinci System, with port access through the fourth intercostal space on the anterior axillary line and the camera port at the same level. Two additional instrument ports were necessary, at the third and fifth intercostal spaces. Percutaneous peripheral cannulation was performed, using the Perclose ProGlide System (Abbot Vascular, Abbott Park, IL, USA) for arterial access. An anterolateral mini-thoracotomy (4 cm) at the fourth intercostal space provided access to the heart. A transthoracic aortic clamp was introduced through the third intercostal space on the posterior axillary line, and aortic cross-clamping was achieved by passing just in front of the trachea, which was anteriorly dislocated by the vascular anomaly. 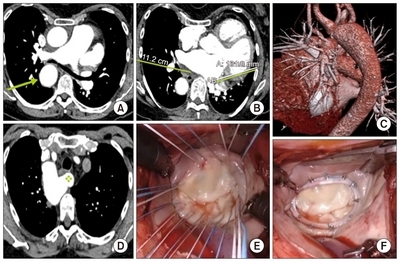 A single dose of crystalloid cardioplegia was injected into the aortic root, and mitral valve exposure was feasible due to an incision of the Sondergaard sulcus. Mitral valve exposure was performed using one of the arms of the Da Vinci System as a fixed depressor for the left atrium. The use of the Da Vinci System permitted the implantation of a 34-mm Carpentier Edwards Physio II Ring (Edwards Lifescience, Irvine, CA, USA) (Fig. 1E, F). A Cor-Knot device (LSI Solutions, Victor, NY, USA) was used for fixation of the sutures. Additionally, a left Cox maze procedure was performed with cryoablation of pulmonary vein inflow, the left atrial appendage, and the mitral line. The patient’s postoperative course was uneventful, and she was discharged on the seventh postoperative day in optimal clinical condition with no residual mitral regurgitation on follow-up echocardiography. The patient signed an informed consent as in the usual protocol of University Hospital of Zùrich. Mitral valve repair with the use of the Da Vinci System has proven to yield valuable results, even if patient selection remains an important step during preoperative planning [1,2]. Limited data have been reported regarding the use of robotic surgery in the presence of sternal anomalies . Various surgical approaches, including right minithoracotomy, left thoracotomy, conventional sternotomy, and combined reconstructive procedures have been reported . Median sternotomy is the most commonly-performed incision for mitral procedures, and in the setting of chest anomalies, it could be used to attempt a simultaneous correction. However, wound complications, especially in obese patients, and difficult access to the mitral valve in the presence of cardiac rotation present challenges. Left thoracotomy could guarantee feasible access to the mitral valve in the presence of levorotation of the heart . This approach for surgical access has been reported for reoperations, but in most cases, a superior left atrial incision should be performed. Moreover, the ascending aorta is not easily reachable using a left-sided approach, and in the present case, the presence of a right aortic arch represented a technical contraindication. Right thoracotomy with or without the Da Vinci System is a valuable option for patients with sternal anomalies in order to reduce postoperative wounds and respiratory complications. However, when this approach is used, leftward displacement of the heart creates some issues for repair techniques. The use of a robotic technique could help minimize the problems associated with a large distance between the surgeon and the operative field; moreover, using a dynamic atrial retractor makes it possible to regulate exposure over time. In the present case, a right aortic arch with an aberrant subclavian artery represented an additional challenge, and several issues regarding the cross-clamping technique were debated. The use of an endoclamp was rejected due to the risk of acute left subclavian occlusion and issues regarding cardioplegia administration. External cross-clamping was feasible, with a surgical plane just in front of the trachea. The robotic system, with high-quality images, enabled an optimal intraoperative analysis of the aorta, facilitating conventional cross-clamping. Furthermore, although in some cases this approach may appear to be contraindicated in patients with a chest deformity due to possible conflicts between the arms of the robotic system, we did not experience any problems with the set-up described above. The accumulation of further experience appears to be mandatory to facilitate an optimal understanding of this complex scenario. Fig. 1. (A) Chest computed tomography showing pectus excavatum with compression of the right ventricle and a right aortic arch (green arrow); (B) distance from the Sondergaard plane to the skin; (C) 3-dimensional reconstruction of the anomalous right aortic arch; (D) left subclavian artery with a retro-esophageal course; and (E, F) intraoperative features. Bush, B, Nifong, LW, Alwair, H, and Chitwood, WR (2013). Robotic mitral valve surgery-current status and future directions. Ann Cardiothorac Surg. 2, 814-7. Chitwood, WR, Rodriguez, E, and Chu, MW (2008). Robotic mitral valve repairs in 300 patients: a single-center experience. J Thorac Cardiovasc Surg. 136, 436-41. Jones, WG, Hoffman, L, Devereux, RB, Isom, OW, and Gold, JP (1994). Staged approach to combined repair of pectus excavatum and lesions of the heart. Ann Thorac Surg. 57, 212-4. Onan, B, and Bakir, I (2016). Robotic mitral valve replacement in pectus excavatum. J Card Surg. 31, 306-8. Bastidas, JG, Razzouk, AJ, Hasaniya, NW, and Bailey, LL (2013). Left thoracotomy: an ideal approach for mitral valve replacement in patient with severe chest wall deformity. Ann Thorac Surg. 96, e63-4.